Since iOS 6 came out yesterday, I've been testing it on the iPhone 4S and the new iPad. Generally, it's a solid update but has a number of tradeoffs. Siri has definitely been improved, the notifications screen does more, and the Passbook feature seems useful. 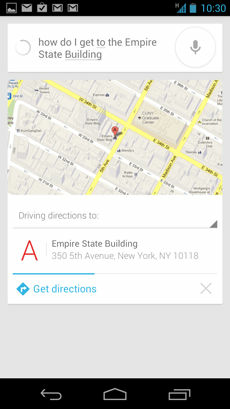 On the other hand, as others have noticed, the new Maps application, which replaces Google Maps with Apple's, is flawed. It adds turn-by-turn directions and Yelp integration, for instance, but lacks much of the street level detail Google Maps has. I thought I'd try this out by comparing the results I got using Siri on an iPhone 4S with iOS 6 and the speech recognition features on the Samsung Galaxy Nexus running Android 4.1 (Jelly Bean). 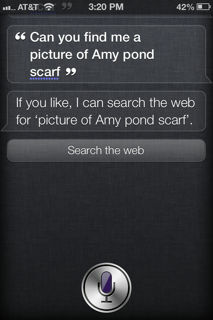 When I did this with the previous version of Siri, Jelly Bean won easily, but this time the results were closer. I started by asking how the Cubs were doing. Both easily recognized my query, and gave me a logical spoken answer. 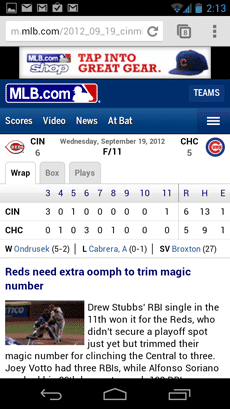 The difference is that with Jelly Bean, there is an obvious one-click link to "recap and highlight" and that brings up an MLB.Com page with all the results. Clicking on the Yahoo! icon in the lower right-hand corner of Siri told me I didn't have the Yahoo! 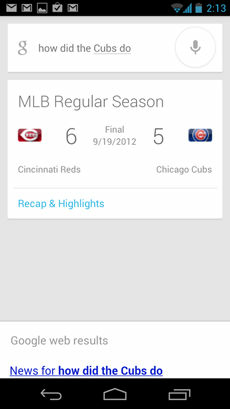 Sportacular app installed, and didn't even provide a link to install it. 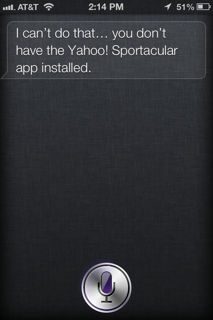 When I directed Siri to "install it," it just searched for places named "install it." Then again, I wasn't expecting either product to work as well as the commercials. Still, Siri now understands sports questions (which it didn't before) and its basic results are more useful and attractive. Jelly Bean makes it easier to drill deeper, though. 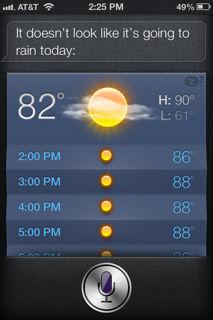 Siri's responses are a bit prettier and more detailed, but both are fine. 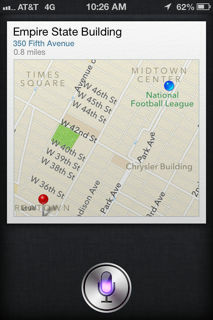 This is a big improvement from before, when Siri didn't recognize sports teams. 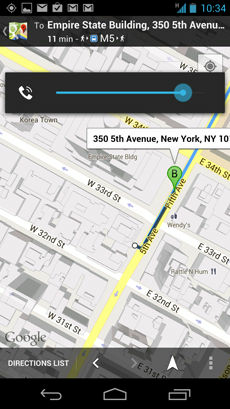 Jelly Bean replied, "No, rain is not expected today in Manhattan. The forecast for today is 72 degrees and mostly sunny." Google Now then showed the forecast for the next four days. 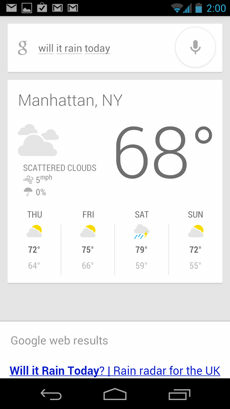 Score this one for Google, which pulled up the correct weather. 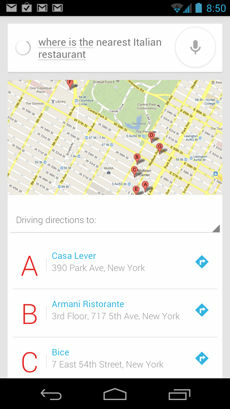 I then asked the phones to find me a nearby Italian restaurant. 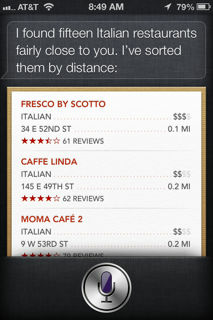 Siri came up with a list sorted by distance, which included restaurant ratings. Clicking on a restaurant brought me to a details page with the Yelp reviews, a link to the phone number, its website, and a simple map. It was a great answer. Jelly Bean immediately brought me to a map, offering driving directions to eight restaurants in the area, but there was no rational order to the list. Clicking on driving directions let me switch to other modes of transportation (including walking) and clicking on the letter next to each name brought up a review from Zagat, but that wasn't obvious. Jelly Bean's answer was useful, but Siri's had more choices in an apparent order. Then I asked for directions to the Empire State Building. 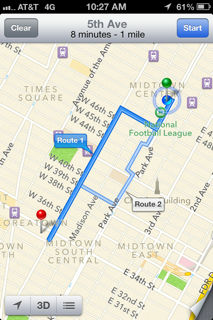 Siri immediately showed me a map and asked if I wanted to call it or wanted directions. When I said I wanted directions, it showed a fine map, but only offered driving directions. 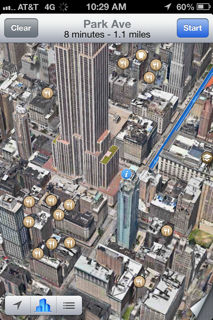 The map has a good-looking 3D view with some restaurants and things noted. Jelly Bean also brought up a map. 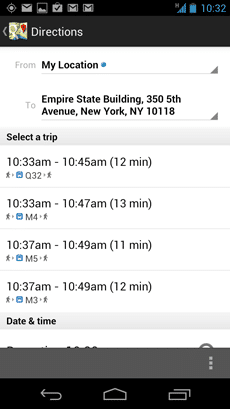 Then it immediately switched to the Maps application and the driving directions were comparable. One big difference is that you can choose from driving, transit, cycling, or walking directions. 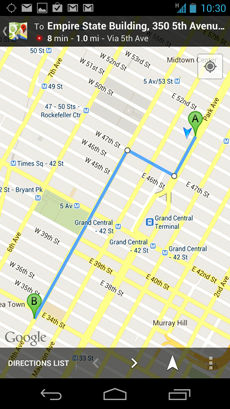 Here are the transit directions. This offers a number of different layers (including terrain and satellite maps) and a bit of a 3D feature itself, but it doesn't look quite as good as Apple's. Still, the walking, biking, and transit directions make up for it, not to mention that Google Now intelligence learns your home and office locations and proactively brings up relevant traffic information. I'll give Jelly Bean the nod here. On general voice recognition and searching, the two are both pretty accurate, but neither is perfect. 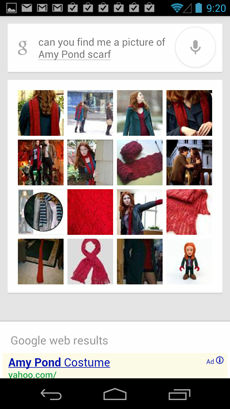 I asked both to "show me a picture of Amy Pond's scarf," and both ended up with identical results. Siri, however, first asked if I wanted it to search the Web, and then brought me to a browser page. 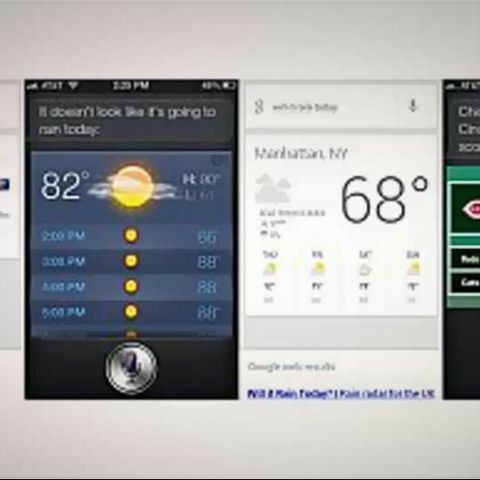 Overall, I'd give Jelly Bean and Google Now a bit of an edge over Siri (in large part because getting the temperature wrong is silly), but Siri has definitely improved, and I do like the Yelp integration. My first impression is that iOS 6 is a nice upgrade, but not one that will make for a big win for users of older iPhones. I was able to install it and upgrade my systems without problems on both my devices. 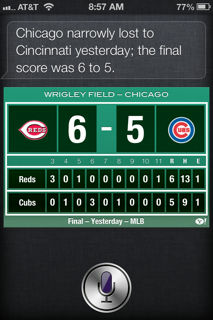 As I've showed, Siri is indeed stronger, although still with a few rough edges. The new Maps app is pretty and I like having turn-by-turn directions, but the older Google-powered Maps was more useful in many ways. Passbook will be more practical as more applications roll out support for it. I do like some of the new notifications, but again it needs support from more apps. I also like some of the more minor features, like the ability to text back to a phone call instead of just accepting or denying it. 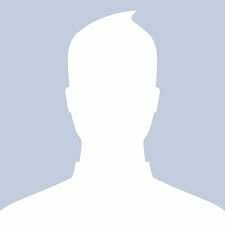 I also like the ability to take a photo and immediately share it via Facebook, email, message, photo stream, or Twitter. You can more easily copy and print it. Some people have reported wireless issues, particularly with public Wi-Fi spots, but I haven't noticed any. I haven't used it enough to judge battery life, but it doesn't look any better. Overall, I'm sure there will be good reasons to upgrade older devices as more apps roll out support for the new features and as some of the minor issues get fixed, but I don't really see a rush right now. The case is stronger for iPad users who want Siri, though.